Sarah Nader- snader@shawmedia.com Woodstock's girls basketball manager Leighanne Pala is called on the court before Saturday's game at Woodstock High School January 30, 2016. Leighanne was a terrific player while growing up, but suffered a horrible spinal injury and cannot play. During Senior Day the coach arranged to have her play for a brief moment at the start of the game. 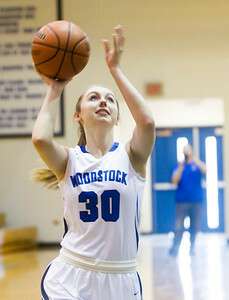 Sarah Nader- snader@shawmedia.com Woodstock's girls basketball manager Leighanne Pala shoots a layup during Saturday's game at Woodstock High School January 30, 2016. Leighanne was a terrific player while growing up, but suffered a horrible spinal injury and cannot play. During Senior Day the coach arranged to have her play for a brief moment at the start of the game. 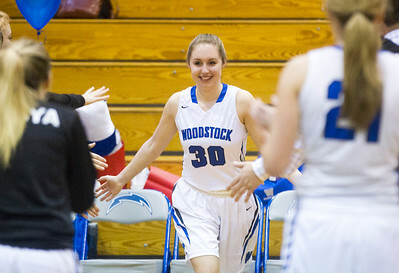 Woodstock's girls basketball manager Leighanne Pala is called on the court before Saturday's game at Woodstock High School January 30, 2016. Leighanne was a terrific player while growing up, but suffered a horrible spinal injury and cannot play. During Senior Day the coach arranged to have her play for a brief moment at the start of the game.